Smoke 14A ended their summer season with a Championship win in the Gold Bracket at the USSSA Queen of Diamonds Tournament on July 23, 2017. Smoke battled their way all weekend with only 9 players, taking 1st place in an international tie breaker against Norcal Thunder. Smoke 14u came out on top with a 5-4 win. 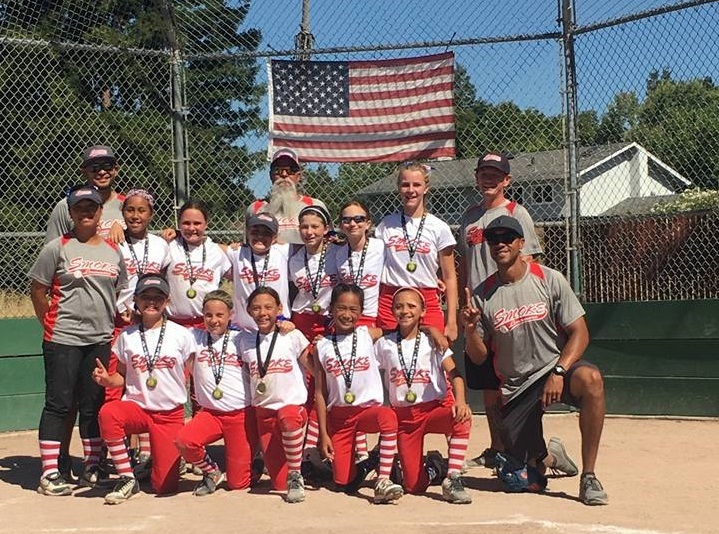 Smoke didn't commit a single error in the infield during their championship game. Way to battle ladies! We are very proud of your hard work and dedication! Top Row: Coach George Gumataotao, Coach Paul Schrader, Emily Simon, Christiana Gumataotao, Meleana Kaheiki-Farias, Erin Schrader, Macy Hoeke, Manager Aaron Castro, Coach Dan Figlenski. Bottom Row: Zoey Figlenski, Keana Castro, Erika Beakey. Naomi Lin. 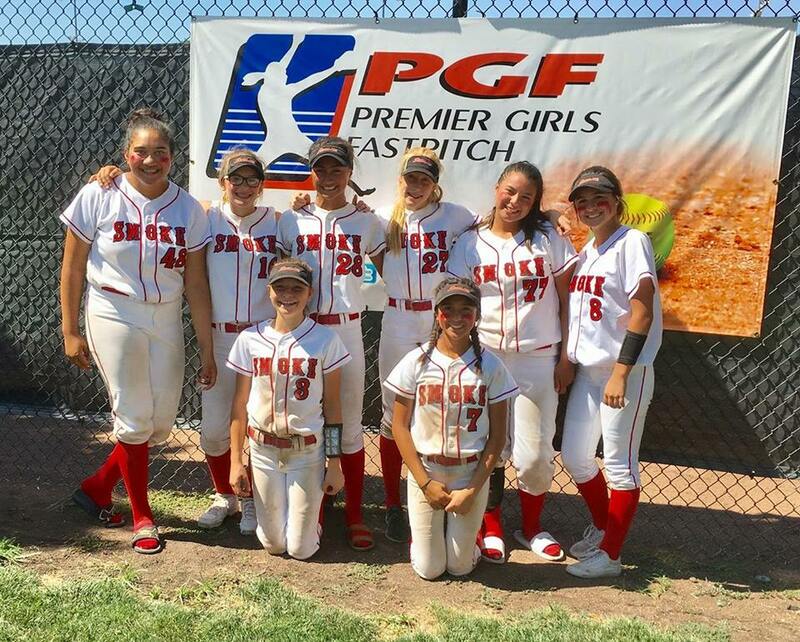 SMOKE 14A played 3 games back to back on Sunday July 9th, with an international tie breaker in the semi finals and only 10 players to end up in the Championship game at their 2nd PGF tourney this summer. These girls battled their way to the Championship, playing without any breaks in over 100° heat! SMOKE took 2nd place at the 2nd Annual Golden State Showcase in Stockton. We fell short, but the girls never gave up! Great job SMOKE! Top Row: Meleana Kaheiki-Farias, Emily Simon, Nayeli Ti'a, Brooke Bowles, Christiana Gumataotao, Macy Hoeke. Bottom Row: Erika Beakey, Keana Castro. Not Pictured: Naomi Lin, Zoey Figlenski, Erin Schrader, Iliza Shields. SMOKE TAKES OVER PLEASANTON TOURNAMENT!! What a great weekend for SMOKE! 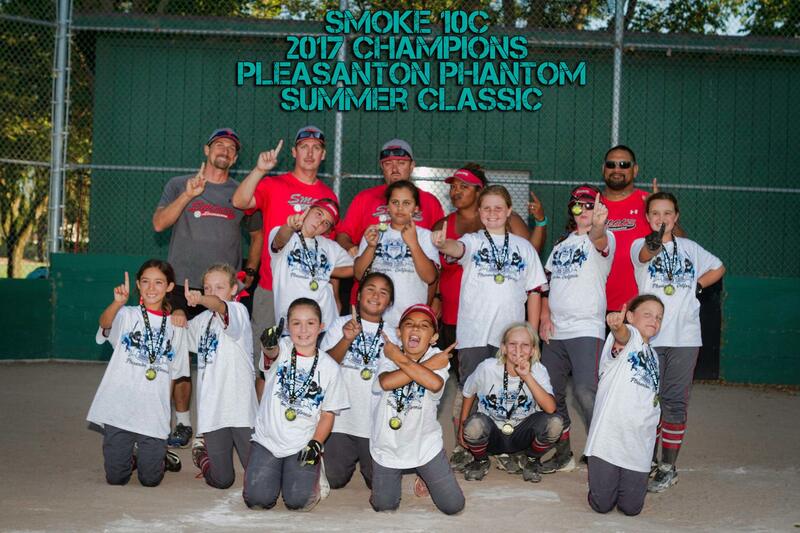 SMOKE took over the Pleasanton Tournament this past weekend with 3 wins! Both our 10B and 10C teams took 1st Place and our 8B took 2nd Place. Well done girls! The Smoke girls came out ready for the weekend with a win over the host Pleasanton Phantom on Friday night, by a score of 6-3. 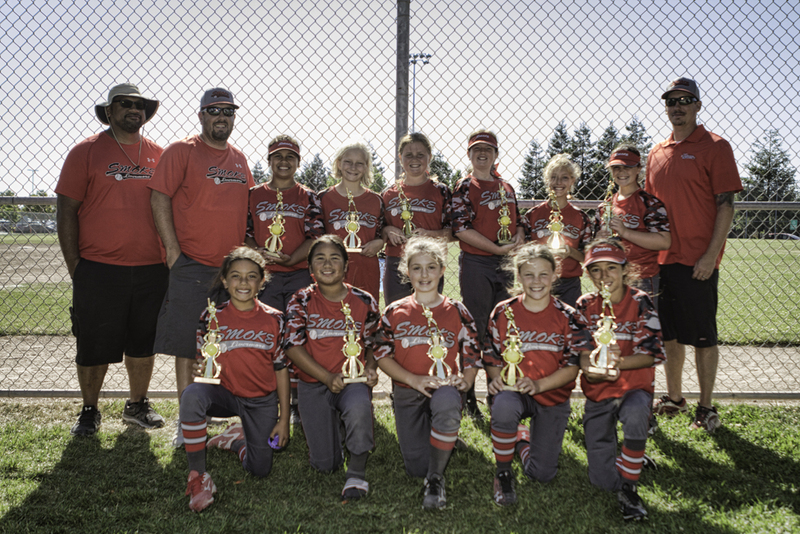 They continued the weekend with a 10-0 win over the San Ramon Stompers and a 13-3 win over the Redwood City Wicked. On Sunday, the girls came out swinging with a 10-2 win over Belmont Blast, and then came back from an early deficit to beat Pleasant Hill Panthers 12-8. This set up a Rematch against Pleasanton Phantom for the championship which was a hard fought, back and forth game that ended with a 4-3 Victory. (Bottom Row) Hannah Armaz, Lainey Macosky, Carly Pine, Madison Hom, Jordynn Booe, Saskia Raab, Maggie Pyke (Top Row)Jordan McCafferty, Delaney Aumua, Reagan Wolf, Caitlin McNeill, Romy Palmer. SMOKE 14A Takes 1ST Place in Reno! Congrats SMOKE 14A for going 5-0 this weekend at the Double Double Tournament in Reno, NV. SMOKE took 1st place in the Gold Bracket. We beat Norcal Rage in an international tie breaker taking us to the Championship game. SMOKE beat Carmichael Pride 3-2. Congrats girls and coaches on your first 14A win! SMOKE 10C Takes 1st Place! 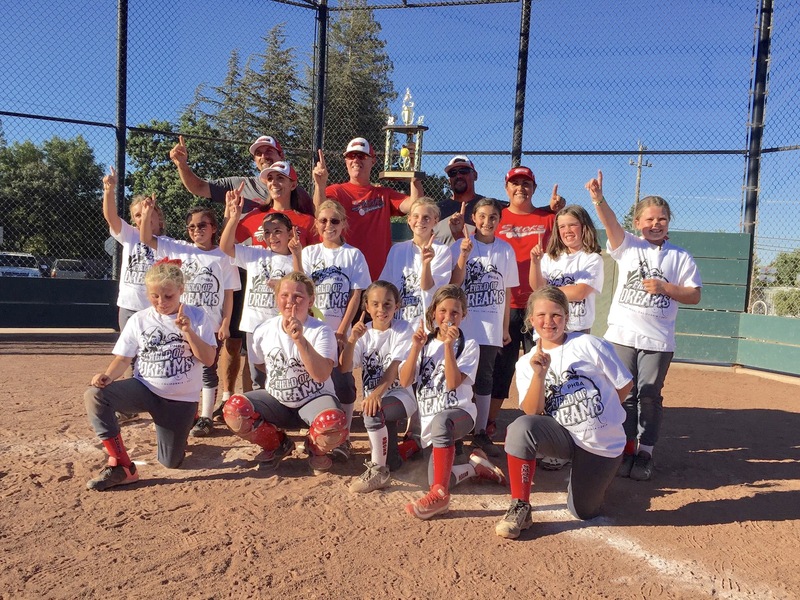 Livermore SMOKE 10U - C Takes 1st Place at the Napa Capitol Sports 10B Tournament. The SMOKE girls traveled up to Napa and brought their bats with them! Over the weekend, they combined to score 47 runs and only allowed 8 while going undefeated through the tournament. These girls continue to grow and push their limits to prove that they belong and can compete on any level presented to them. SMOKE 12A Takes 2nd Place! 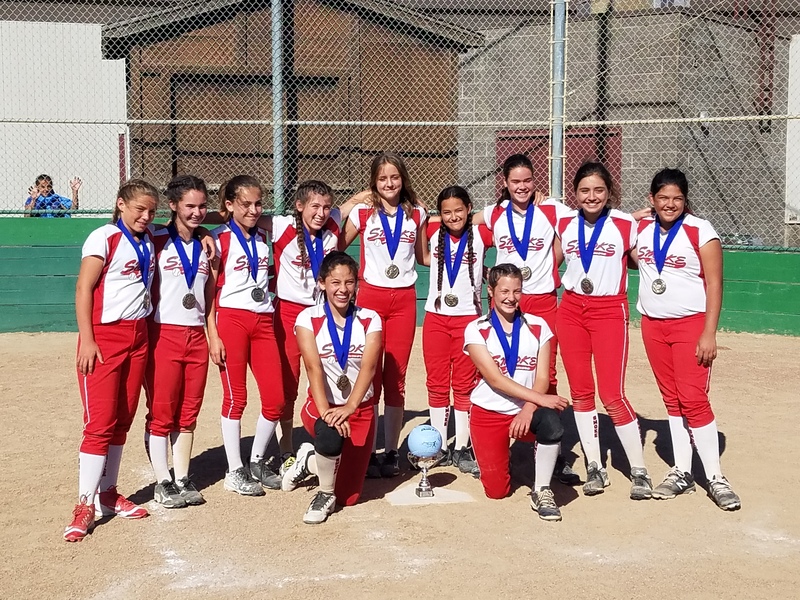 Smoke Fastpitch 12U takes 2nd place in the USSSA Gumball 12B Tournament the weekend of June 10th at the “Pepsi Fields” in Hayward, CA. 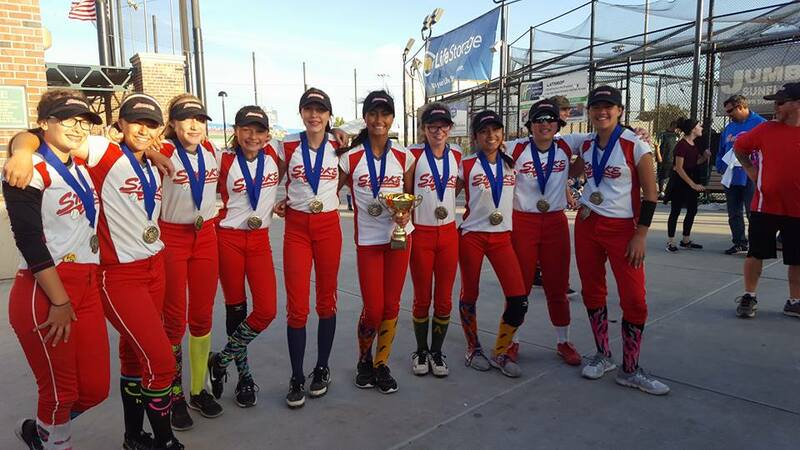 The girls from Livermore backed up a 3-0 Pool play on Saturday by giving up a single run in 3 games on Sunday losing in a 7 inning Championship Game by a score of 1-0 to Martinez Heat. Incredible defense and pitching highlighted this thriller of a Championship Game. A single run in the top of the 7th inning decided the game. Over the weekend Smoke was led on offense by Alizabeth Ruiz (.533), Kayla Urrutia (.500), Kaitlyn Aguilar (.467) and Sophia Palomo (.444). Homeruns by Emma Hatcher, Sierra Black, Alizabeth Ruiz and Kaitlyn Aguilar also punctuated the action. The defense was stout over the entire weekend. Critical plays were made all over the diamond by Alizabeth Ruiz, Kayla Urrutia, Skylar Jester, Audrey Sweet, Mckenna Kibbe and Emma Hatcher. Smoke was led by strong pitching performances by a trio of pitchers. Sierra Black, Alex Mello and Kaitlyn Aguilar combined to strike out 38 batters in 28 innings and surrendered just 10 runs over 6 games. 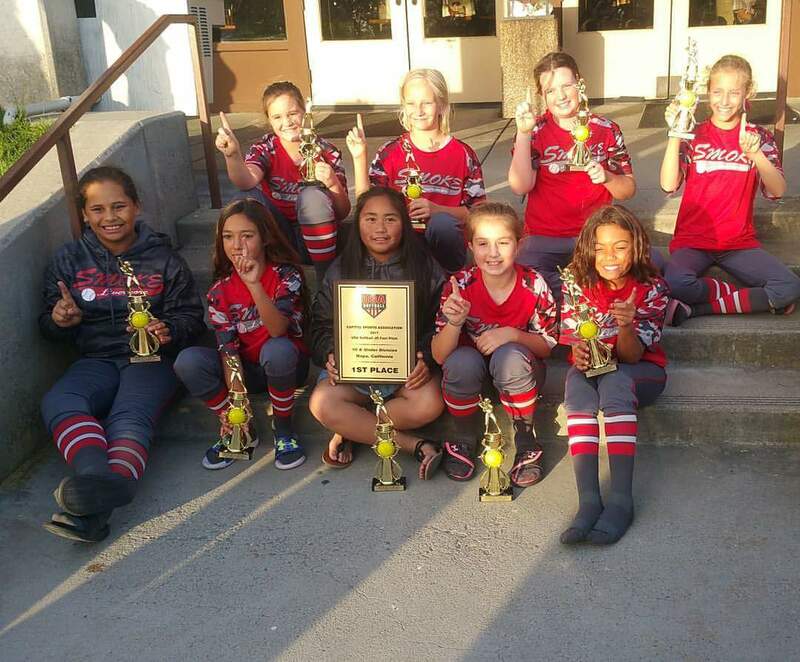 Smoke Fastpitch 12U has compiled a record of 10-2 bringing home a Championship and a 2nd Place finish in its first two tournaments of the season. SMOKE 8B takes 1st Place Silver!! Livermore SMOKE 8B placed 1st in the Silver Bracket at the Bob Grey Classic Tournament in San Jose. Winning 5 out of 6 games in their first tournament together was inspirational and shows hard work pays off. SMOKE 10B Takes 2nd Place!! 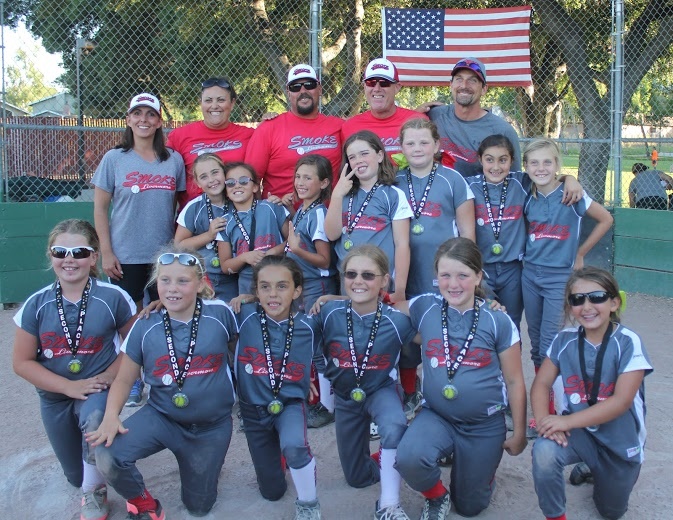 Livermore Smoke 10B Placed 2nd in the USSSA Summer Slam Silver Bracket 10U Open Tournament in Fremont. SMOKE 10C Takes 2nd Place! 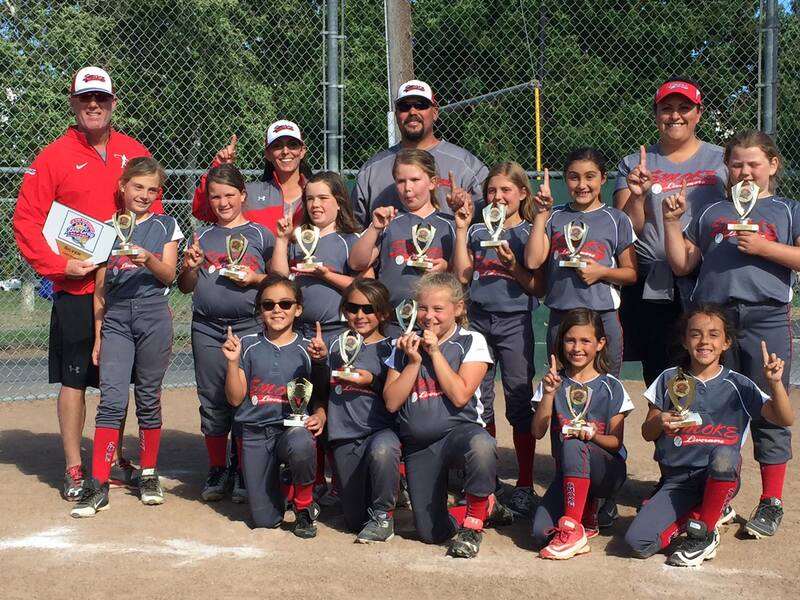 In their first C tournament of the year, the 10U girls played outstanding all weekend long. On Saturday, the girls started their weekend by winning 28-5, 16-3 and finished their bracket play with a 7-3 win to head into Sunday undefeated. The hitting and exceptional pitching continued Sunday with a 13-0 win. In the semi-final game, the girls fought back from being behind three different times and won on a walk-off triple in the bottom of the 6th (9-8). In the championship game, Smoke ran into an extremely talented Union City Fury team and came up short of winning the championship. Nonetheless, these girls played exceptional softball throughout the weekend and have set high expectations for themselves moving forward this summer! (Bottom Row) Jordynn Booe, Madison Hom, Carly Pine, Maggie Pyke and Hannah Armaz. SMOKE 12A Takes 1st Place Gold! 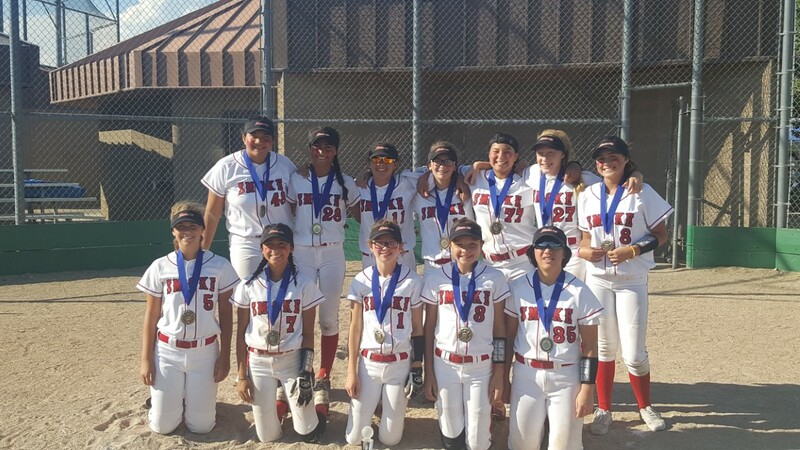 Fremont, CA- The 12U Smoke Fastpitch team based out of Livermore WINS the Gold bracket of the USSSA Summer Slam Softball tournament. It all went down at the Fremont Sports Complex the weekend of June 3 rd . This was the first tournament for the newly created team. The girls competed at an extremely high level for their maiden tournament. The Pitching was stellar giving up 10 runs in 6 games while striking out 22 batters in 22 innings. The offense put across 40 runs which included 8 Doubles, 2 Triples and a Homerun . Their 5-1 weekend was highlighted by a great 10-0 victory over Gavilan Buzz and finally a hard fought game in the Championship over NorCal Team Bownet by a score of 7-4. 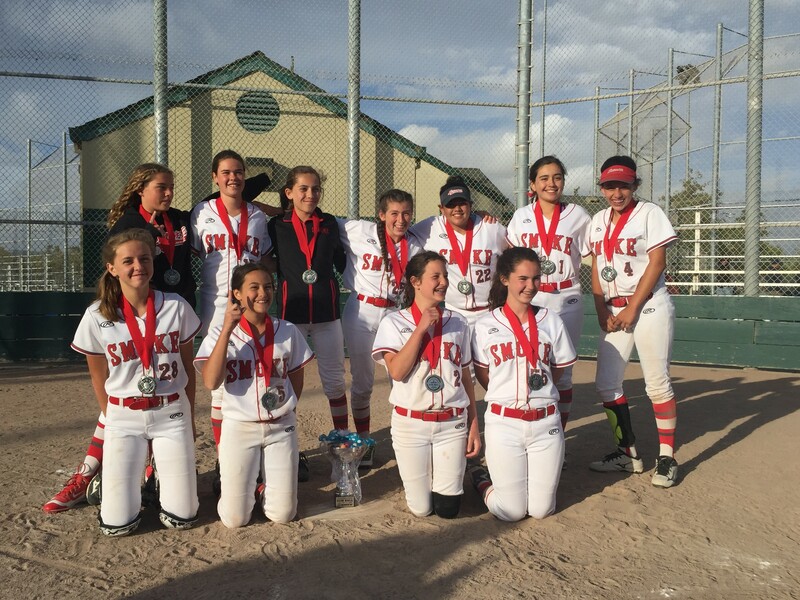 Congratulations SMOKE 14U for taking 1st Place in the silver bracket at the Crazy Socks tournament in Manteca on 5/14/17. Incredible defense from these girls this weekend! You ladies make us proud! Awesome job coaches and players! Way to bring home hardware! From left to right: Emily Simon, Erin Schrader, Brooke Bowles, Erika Beakey, Sadie Wolfe, Nayeli Ti'a, Zoey Figlenski, Keana Castro, Naomi Lin, Iliza Shields.